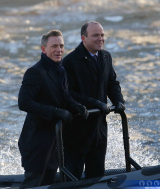 Daniel Craig was in 'SPECTRE' action as James Bond early this morning as he hit London's River Thames on an MI6 powerboat with fellow actor Rory Kinnear who plays MI6 chief of staff Bill Tanner. The pair whizzed by the real-life SIS headquarters building, last seen being blown up in 'Skyfall'. Craig was later filmed from a bridge over-looking the river. Camden Lock on Regent's Canal also saw shooting, but is not doubling for Italy as some reports speculated. 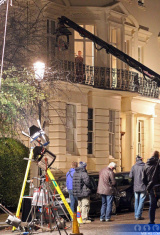 Later, Naomie Harris was on location in Notting Hill, shooting her Miss Moneypenny scenes in the street outside Bond's apartment. Craig was suitably attired in a dressing gown. Earlier in the week, interiors were filmed at Pinewood Studios for the scenes that take place early in the film. Filming is expected to continue at the apartment on Tuesday. 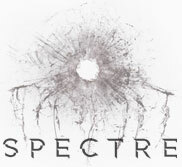 Production then shifts back to Pinewood for a while before 'SPECTRE' hits the foreign locations. 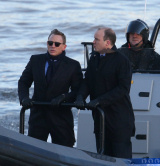 The cast and crew will return to London to shoot more exteriors much later in the schedule.